Tough-as-nails fourteen-year-old Sid may not have expensive boots like the privileged teen riders in Virginia, but she knows her way around horses. Working with her Uncle Wayne since childhood, she’s learned to evaluate horses, break and train them, care for them . . . and ride like a professional. Amid turmoil at home, she dreams of becoming a catch rider—a show rider who can ride anything with hooves. In this salty, suspenseful teen novel, an unexpected opportunity to ride a top-notch horse in an equitation show takes the small-town girl all the way to Madison Square Garden. Jennifer Lyne was raised in Virginia, where she spent a lot of time around horses and eventually managed a small barn. She worked as a location scout for 14 feature films and with her husband wrote and produced two independent features. She lives in New York City. "Everything comes together here—setting, dialogue, horse details and, most impressively, voice—so that the near–fairy-tale ending works; like the rest of the book, it feels absolutely true. A standout." 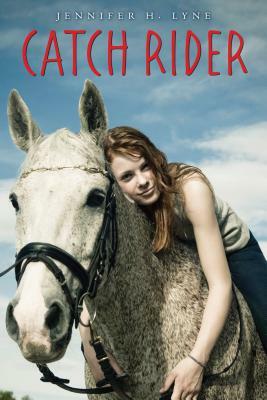 "For many girls, it isn't truly summer without a great horse book—Jennifer H. Lyne's Catch Rider fits that bill." "I'm no horse expert, but this tale sure feels and smells like the real deal. It was a real page turner for me. Perhaps you know a book where there is resolution to the story but you are so into the characters that you are not ready to say goodbye. . . I'm sure hoping to see another book out of this debut author."